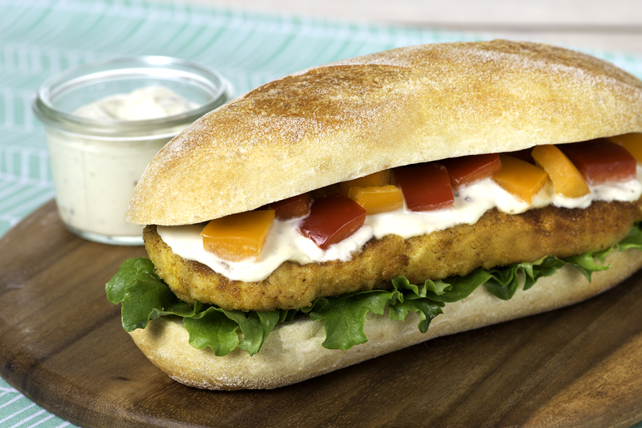 A Louisiana-inspired sandwich with the added flavour of Caesar dressing. Beat eggs in shallow dish until blended; place bread crumbs in separate shallow dish. Dip fish, 1 fillet at a time, in eggs, then in bread crumbs, turning to evenly coat each fillet with each ingredient. Heat oil in large skillet on medium-high heat. Add fish; cook 4 min. or until evenly browned on both sides, turning after 2 min. Place on baking sheet sprayed with cooking spray. Fill rolls with salad greens and fish; top with remaining ingredients. Stir hot pepper sauce into dressing before drizzling over sandwiches.